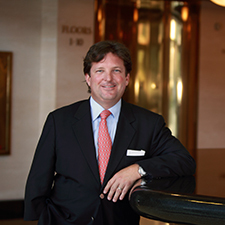 Woodford Webb is President of The Webb Companies, where he oversees the legal and financial management of the company’s large portfolio of residential and commercial investment properties. A licensed attorney, he is also associated in an Of Counsel capacity with the law firm of Webb, Hoskins, Brown & Thompson in Lexington. Son of co-founder Donald W. Webb, Woodford began working for The Webb Companies while in college. He learned the business from the ground up, starting in the maintenance department and progressing to property management, leasing and marketing. He joined the team full-time in 1992 as Vice President of Leasing and Property Management before attending law school and working for several years as an attorney. He returned to The Webb Companies in 1999 as President. Mr. Webb has been awarded several professional honors during his career. In 2008, he received the “Top 20 under 40 Rising Star” award by the Lexington Young Professional Association. In 2011, he was named Commerce Lexington’s 2010 Public Policy Advocate of the Year. In March 2013, he was ranked the 6th Most-Influential Leader in Lexington by the Lexington Herald-Leader and in April 2014, he was honored as an “Amazing 8” by Camp Horsin’ Around for his “amazing service to others.” Most recently, he was awarded the 2018 Downtown Lexington Partnership Outstanding Individual Award for his many years of service to downtown Lexington. A lifelong Lexington resident, Woodford gives back to his community by serving on many local and regional boards. He currently serves as Director of the Downtown Lexington Management District (DLMD), the Downtown Lexington Partnership (DLP), and the Triangle Foundation. He is a former director of Commerce Lexington, First Security Bank of Lexington, Hospice of the Bluegrass, Junior Achievement of the Bluegrass, Kentucky Lottery Corporation, Lexington History Museum, Bluegrass Miracle League, Bluegrass Community Foundation, The Lexington School and Lexington Humane Society. Woodford holds a Bachelor of Science degree in Commerce from Washington & Lee University, an MBA from the University of Kentucky, and a Juris Doctorate from the Northern Kentucky Salmon P. Chase College of Law. He also attained the designation of Certified Property Manager from the Institute of Real Estate Management. Woodford lives in Lexington with his wife and two children.